Astronomers have found a star system that bears striking resemblance to our inner solar system. 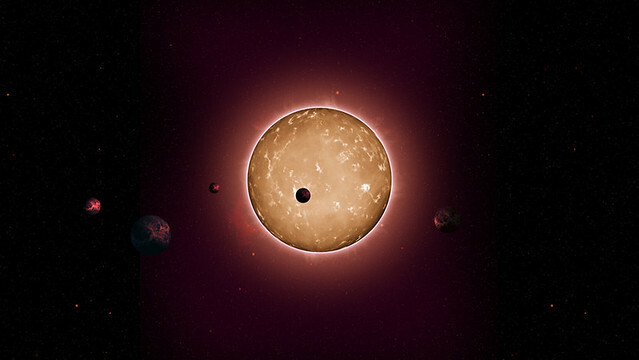 It’s a sun-like star that plays host to a system of five small exoplanets — from the size of Mercury to the size of Venus. But there’s something very alien about this compact ‘solar system’; it formed when the universe was only 20 percent the age it is now, making it the most ancient star system playing host to terrestrial sized worlds discovered to date. Since its launch in 2009, NASA’s Kepler probe has located more than 1,000 exoplanets. And while every newly discovered exoplanet is exciting, the mission’s ultimate end has always been to located Earth-like exoplanets. Researchers at the University of Birmingham, in England, and Iowa State University confirmed the existence of five new Earth-like alien planets after examining data collected on the star Kepler-444. By parsing the dimming patterns (solar seismology) of Kepler-444, researchers we able to determine the relative size and orbits of the five confirmed planets. The five planets orbit their host star — a 11.2 billion-year-old star, 25 percent smaller that the sun — in less than 12 days. Despite being 117 light-years away from Earth, in the direction of the constellations Cygnus and Lyra, researchers were able to learn more about the solar system using a practice called astroseismology. lead researcher Tiago Campante said in a statement. We now know that Earth-sized planets have formed throughout most of the Universe’s 13.8 billion year history, which could provide scope for the existence of ancient life in the Galaxy. Planetary systems around stars have been a common feature of our galaxy for a long, long time. the astronomers wrote in their new paper. We’re another step closer towards finding the astronomers’ holy grail — an Earth-size planet with a one year orbit around a star similar to our Sun. Bottom line:So that begs the question: if rocky planets formed 11.2 billion years ago around other stars, could there be a few that did have just the right conditions for life to be sparked? If so, could alien life have already come and gone in our galaxy’s history? Or could this ancient life be persisting for, potentially, 10 billion years after it first formed?